Freshman Sen. Ted Cruz (R., Texas) challenged the Republican Party to return to championing growth and opportunity for the lower and working classes during a lunchtime address at the National Review Institute Conference Saturday afternoon. Speaking without a lectern or notes, Cruz moved easily around the stage as he presented his vision for the Republican Party’s future to the audience at the conference. "The policies of the Obama administration have fundamentally failed the communities struggling to climb the economic ladder," Cruz said. Cruz contrasted the Republican vision of opportunity with the Democrat’s social goal: "The message of the left is a message of dependency. It’s a message of control." Cruz said that Mitt Romney’s 47 percent comment captured "the narrative of the last election." Voters thought that Republicans did not care about those in the lower and working classes, Cruz said. But, "Republicans are and should be the party of the 47 percent." Cruz encouraged Republicans to analyze bills by seeing how they impact those at the bottom of society, what he called a "Rawlsian lens." Republicans should not be the party of big business, as big businesses loves big government, he said. Cruz talked about the impact that four percent growth would have on the country. Four percent growth over 10 years would generate lots of jobs and trillions of dollars of new revenue, Cruz said. Cruz hailed a new generation of Republican leaders whom he called the "children of Reagan," including Govs. Bobby Jindal, Chris Christie, and Bob McDonnell. 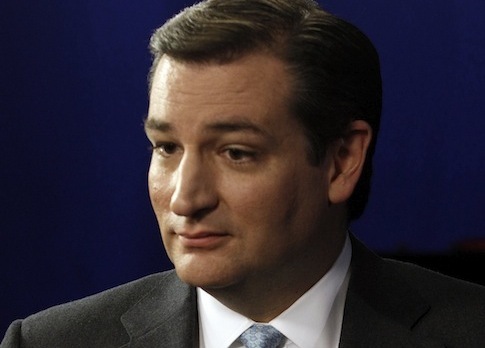 Cruz did not just look at the long-term future of the Republican Party, however. He also provided some strategic advice for the short-term. He encouraged conservatives to "stop reading the New York Times and encouraged Republicans to oppose the president’s agenda. He said that Congress should use "leverage points to make real progress on the fiscal and economic crisis." Cruz fielded questions from the audience at the end of his talk. He lamented the "55 million souls" lost through abortion and said that Ronald Reagan should have won the Nobel Peace Prize for ending the Cold War. This entry was posted in Politics and tagged Media, National Review Institute, Ted Cruz. Bookmark the permalink.